The perfect fence does more than just keep out any nosey neighbours. A spot-on design can lift a yard or a home and dramatically improve valuations. Bold colours, the right mix of modern and durable materials and a fine fencing style can take the aesthetic of your home to a whole new level. Building a new fence can be exciting for homeowners, but it’s also one you want to get right the first time. Thankfully, there are plenty of options to choose from to ensure your new fence looks the goods. And if you decide to build with quality Australian materials, you can rest assured your fence will be solid and durable enough to enjoy with your family for years to come. So what options do you have to choose from on your next fencing adventure? We’ve put together all of the essential selections that go into every great fence to give you the best chance at building the best. The style of your customised fence is choice number one and often dictates the type of materials you’re going to need. The position of your fence mixed with the styles placed around it will determine the ideal fencing style for your project. If you’re fencing off a balcony, for example, it will need an entirely different aesthetic to a pool fence or backyard rail. Often the choice begins with modern fencing vs. a vintage approach. Do you want it to stand out, or blend in? Is it a statement fence or one to keep the rabbits out? Don’t think it’s entirely fixed to your existing area, though – many heritage fences look exceptional against modern homes, and vice versa. If you want to be a little daring, consider getting an expert fencing professional in to offer their advice on the perfect design. After selecting the style next, comes practicality. This determines the materials. Where is the fence being installed? What are the primary concerns – is its security, privacy or noise reduction, or something on trend stacked with street appeal to turn more heads? There’s a material to fit every need, and you can always go with a custom design kill two birds with one stone. Steel fencing and wrought-iron materials are a top choice for security and durability making them perfect for pool covers and minimalist fences. Glass fences dramatically boost the value of your home and turns your swimming pool or balcony into an instant masterpiece. Aluminium slats offer a modern feel while also allowing a sense of privacy. Or if a secure surrounding wall is needed, there’s always modular fencing styles. Perhaps the hardest choice with any interior or landscape design is the right blend of colours. Too dull and everything fades, too big and you’ll curse yourself every time you see it through the window. Materials like Colorbond come in a huge range of colourful options which makes life a lot easier or the process of choosing more enjoyable. The best approach is to coordinate, complement or match colours to surrounding styles of buildings or nature. You also want to choose if the fence is to become a feature or part of the background. Perimeter fences should blend in while decorative fences should stand out. Each colour also has a personality. Blue tones add depth, grey fits with architecture and most reds and oranges are traditional choices. When looking for materials, check the swatches and play with ideas to find a combination that makes you happy. Most fencing for private homes need a gate, even if it’s just for occasional use. Choose a single gate for people traffic only, or a double gate if cars need access as well. Swinging gates are a traditional choice for most fences but if you’re researching for your residential driveway or a factory entrance, check out automatic sliding gates. They’re a highly popular choice for their sleek, stylish and modern look as well as the discerning security. From picket heads to post caps, decorations make or break a fence. To make matters worse, the list of ornamental items out there is practically endless. Our advice is let yourself dream, and your heart decide, but be sure not to overdo it. You don’t want to end up looking more like a primary school art project. Research the possibilities, but consult with a design expert (or a trusted friend) before you push the button! 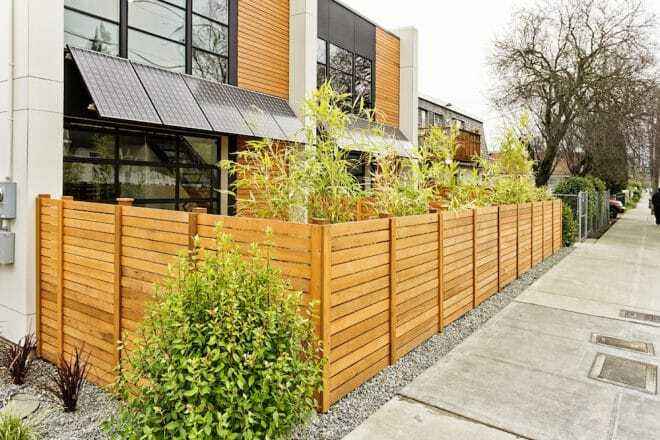 Building a fantastic fence for your home is simply a matter of getting all of these elements right. While it’s not easy and may take some time to collect all the options, consider each aspect and make a final call, the stunning results will all be worth it. And if you’d like the experts to give you a hand creating the perfect fence for you, we’d love to help. Give us a call today!